Is Don Ukranian? Based on the latest jacket, you might think so.! But no, I dont think he is. I think he might be secretly gay, though! So secret that he doesn’t even know yet himself; kind of like being in the ‘inner’ closet. I don’t care what anybody says. 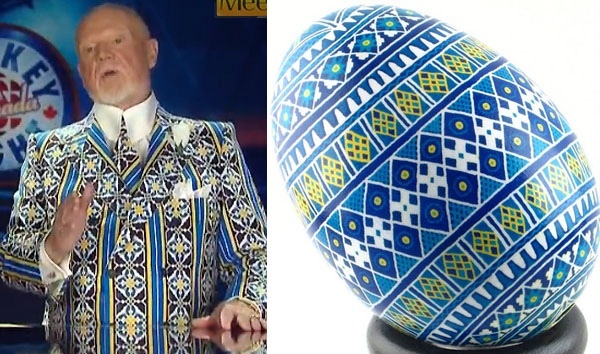 In my opinion, Don Cherry is the best dressed WOMAN in hockey. Is he really gay? Don. Who thinks these styles up? Give him/her a raise if it’s not you. Don’t forget to add the bright yellow suit he wore during yesterday’s Canucks-Predators game.